Check out The Shelter trailer. 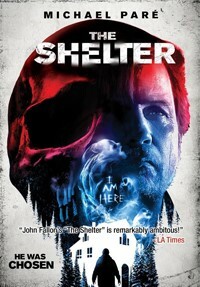 The critically acclaimed psychological thriller “The Shelter”, starring iconic actor Michael Paré (“Streets of Fire”), is now available for viewing around the world, thanks to its newfound home on Vimeo On Demand: https://vimeo.com/ondemand/thesheltermovie. The film, which the L.A. TIMES said was “remarkably ambitious” and was “a concise genre piece that doubles as a heavily metaphorical character sketch”, had previously been released on DVD and VOD in the United States, and was also sold in various countries around the world including Belgium, Denmark, Finland, Iceland, Luxembourg, Malaysia, Netherlands, South Africa, Sweden and South East Asia. But now the rest of the world gets their chance to watch the psychological suspense film which critics loved at the London Frightfest, as well as the Sitges Film Festival. The film is about a homeless man named Thomas (Michael Pare) who finds shelter for the night within a lavish abandoned two-story house. He eventually discovers that he is not alone and the premises won't let him leave.